Learning a language is never an easy task. It takes practice and dedicated study. Learning American Sign Language (ASL), a visual-gestural language, with no auditory input, might be even more challenging. American Sign Language has been recognized as a fully natural language by linguistic researchers for the past fifty years, but it is still gaining recognition – and popularity – in America. A visual language with its own grammatical rules, ASL includes hand shapes, movements and facial expressions. In learning ASL, students are not only learning another language, but also learning a language in a different modality. 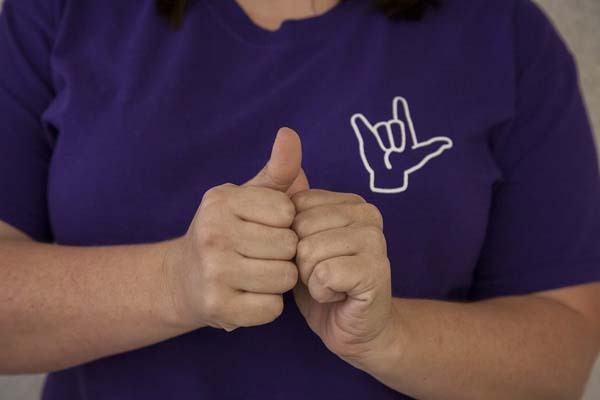 “Many are accustomed to perceiving language through their ears, now imagine learning a language with your eyes,” explains Star Grieser, ASL program head. Tidewater Community College is the only college in Hampton Roads that offers the full ASL career studies program, which includes ASL I through IV. The program includes ASL courses, but also classes on the history and culture of the deaf community, as well as a course discussing prospective career opportunities in working with deaf and hard of hearing people. Comparative Linguistics of ASL and English; Foundations of Interpretation; and Translation Skills are among the classes offered. TCC offers an Associate of Applied Science in ASL-English Interpretation. The degree program is a two-and-a-half year, full-time program. Upon graduation students are prepared for entry-level interpreting employment in K-12 educational environments within the community or with government or private agencies. The college also offers a Career Studies Certificate in American Sign Language. Students also participate in the annual ASL-Ville, a day-long event sponsored by the TCC ASL club, which includes workshops, demonstrations and entertainment.